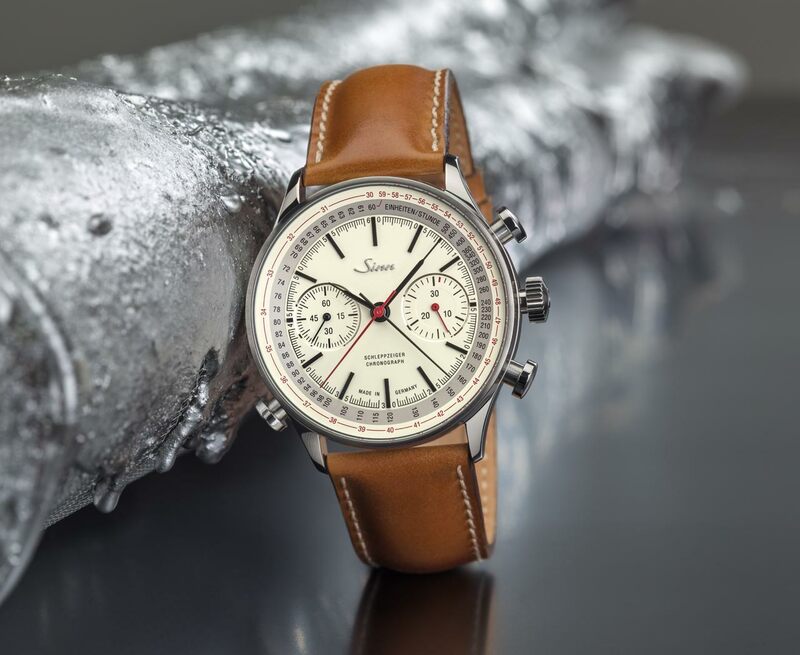 Produced to mark Sinn’s 55th anniversary, the 910 Anniversary model is a vintage-looking chronograph with split-seconds mechanism for recording intermediate times. 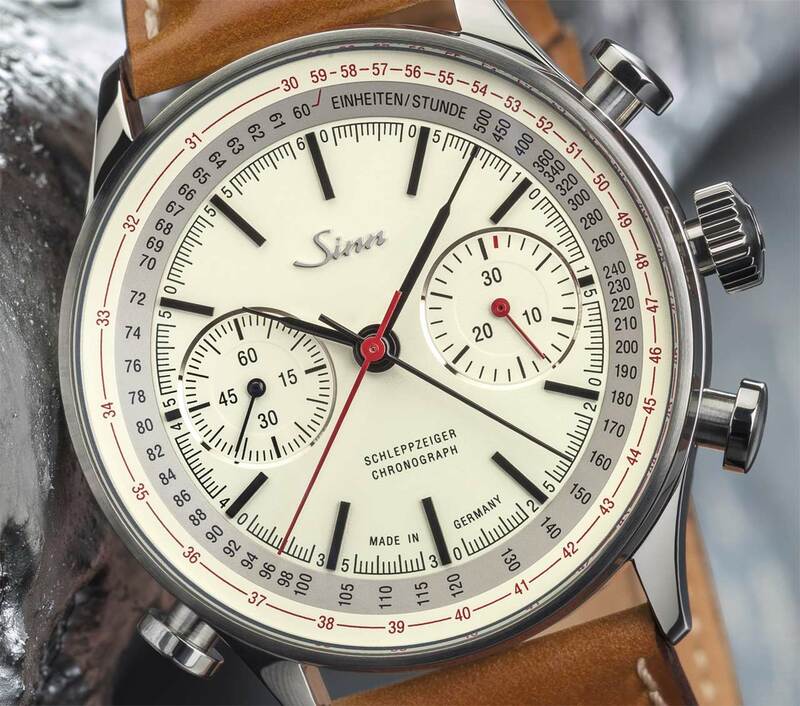 The warm-toned dial - with small seconds at 9 o’clock and 30-minute chronograph counter at 3 o’clock - has the particularity to feature a double tachymetre scale which extend the readings to 30 units (e.g. kilometres) per hour instead of just 60 units. The split-seconds hand moves in sync with the red seconds hand until the push-piece at 8 o’clock is pressed. This operation stops the split-seconds hand allowing one to read the intermediate time with precision. 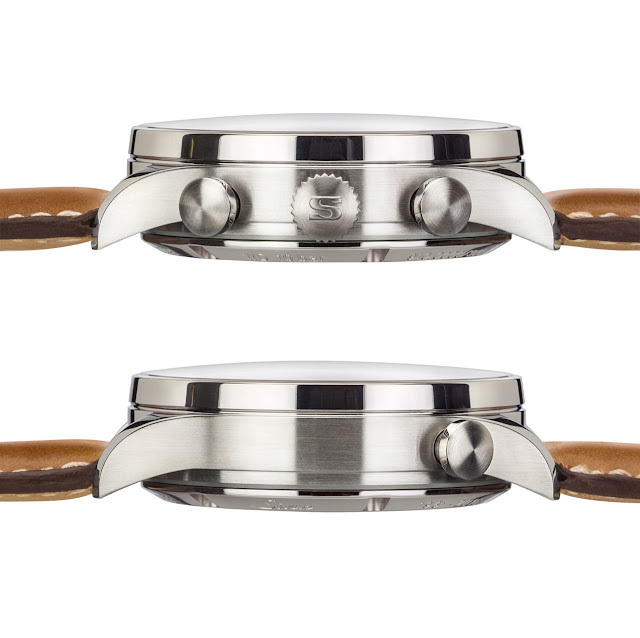 When pressing the push-piece again, the split-seconds hand catches up with the seconds hand and continues to move in sync with it. The Sinn 910 Anniversary is powered by a shock resistant and anti-magnetic Valjoux 7750 self-winding movement. 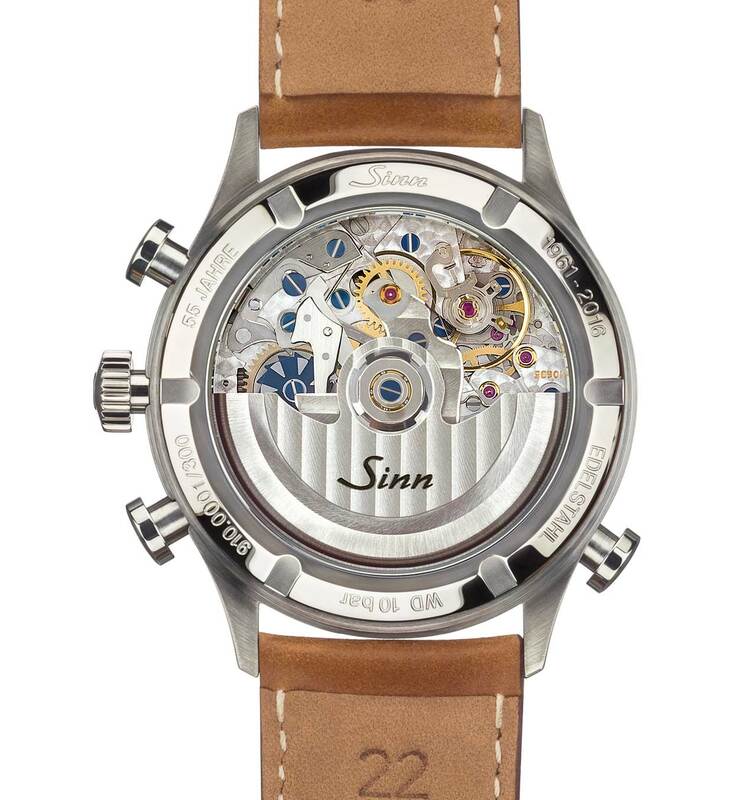 Beating at 28,800 vibrations per hour, it features a ratchet wheel control mechanism - visible through transparent sapphire crystal back - which controls the start, stop and reset functions. Since this component is subject to high levels of stress, it is essential that the mechanism is assembled with the utmost care and precision to minimise wear and tear. The stainless steel case, alternating polished and satin-brushed surfaces, has a diameter of 41.5 mm and a total thickness of 15.5 mm. Waterproofness is 10 bar / 100 metres / 330 feet. Baselworld 2016. 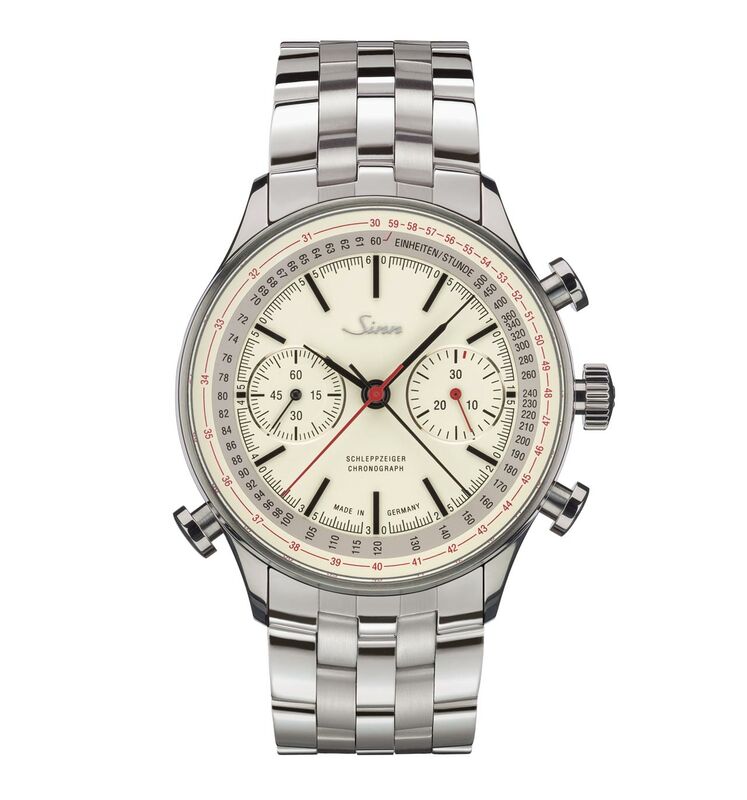 Sinn 910 Anniversary Split-Seconds Chronograph. 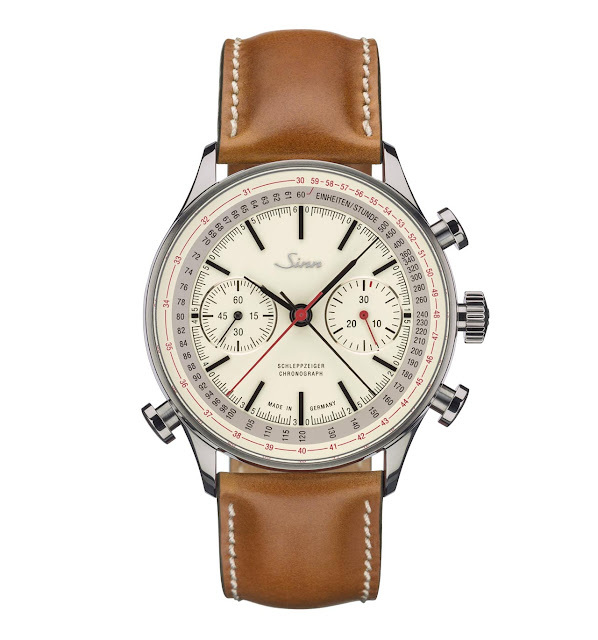 Produced to mark Sinn’s 55th anniversary, the 910 Anniversary model is a vintage-looking chronograph with split-seconds mechanism for recording intermediate times. 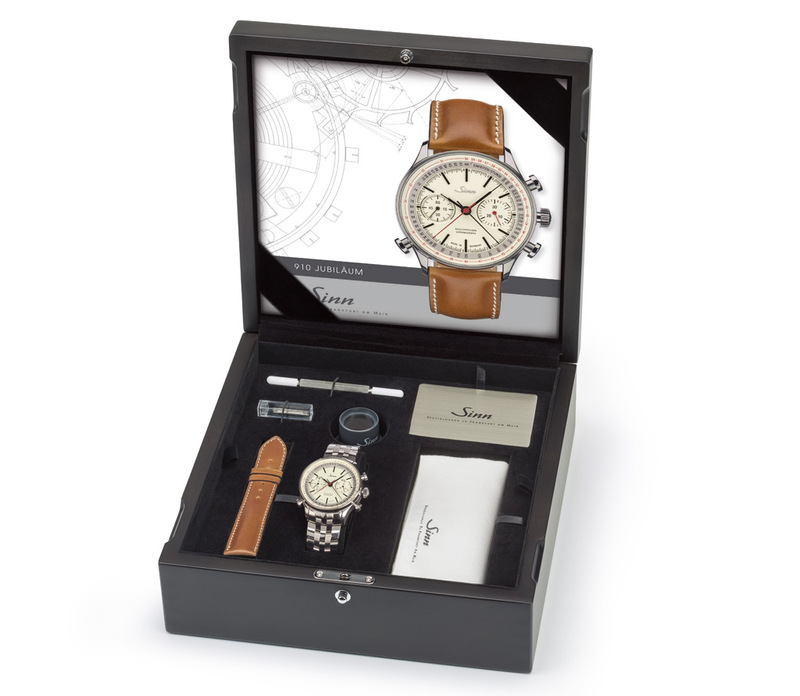 A limited edition produced in 300 pieces, the Sinn 910 Anniversary has a retail price of Euro 5,500.